Assistant Professor, Department of Mechanical Engineering, SRM IST, Chennai. calorific value stimulates usage of hydrogen energy like twin fuel manner in diesel engine. increased for 8lpm H2 addition with B20 fuel. energy. Moreover, H2 be innocuous, unscented plus consequences while thorough burning . expensive through unreal fuel or methanol automobiles with coal ingestion or fuel charge . The notion of consuming hydrogen like substitute fuel intended with diesel devices is topical. enhancement about efficacy of H2 making, harmless and suitable on sustenance storing. table.1 provides several possessions about hydrogen at 25ºC and 1 atm. The representation along with pictorial view of the investigational arrangement is exposed in Fig. instated in the inlet manifold in diverse course rate viz. 4lpm, 8lpm and 12 lpm correspondingly. meter and flow regulator valve which are exposed in figure.3. flame set-up which capture any backfire as of the engine. It as well performances equally a nonreturnable controller. The hydrogen stream amount is restrained by the digital gas flow meter. associated through well-ordered diesel fuel process. accumulation thru inlet air exhibited the upgraded recital by related to usual neat diesel procedure. carbon in hydrogen fuel moreover decreases the HC releases to a better scope [25, 26]. correspondence proportion, a decrease in CO is perceived for hydrogen twin fuel process. whole CO deliberation to upsurge at full capacity associated to diesel. the complete sort of maneuver. stayed attained through 8lpm hydrogen accumulation, related to diesel and B20 fuels. commonly associated to diesel at complete capacity. engines accomplish thriving and release fewer effluence associated to well-ordered diesel fuel. 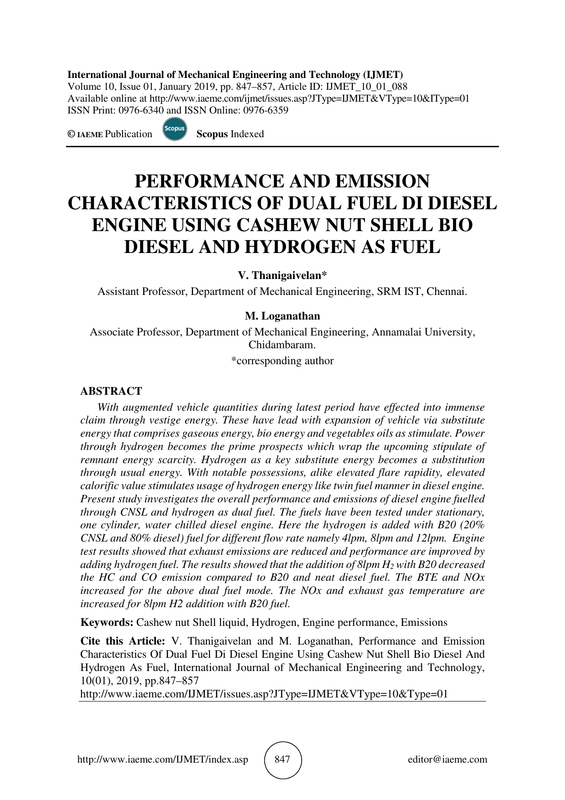 Verhelst S, Sierens R. Aspects concerning the Optimization of a Hydrogen Fueled Engine. Int J Hydrogen Energy 2001; 26:981–5. vehicles SAE paper 931813; 1993. p. 471–9. application. Int J Hydrogen Energy 2002; 27:479–87. operation of hydrogen in a C.I. Engine Proceedings of the National Conference on I.C. development scenario. Int J Hydrogen Energy 2003; 28:267–84. Shudo T, Suzuki Hi R. Applicability of heat transfer equations to Hydrogen combustion. Cycle and Emission Potentials), SAE Paper No.020373, 2002. Congress,23-27 May ,2004 ,Barcelona ,Spain . Energy, Vol.34,No.1, pp. 328- 334 , 2009.
due to crevice volumes in a hydrogen fueled engine, vol. 123. ASME; 2001.
engine with high power and high efficiency. In: 2002 Fall technical conference of ASMEICED, 8–11 September, 2002. p. 2-12. Institute of Science, Erzurum 2011, pp 45–55. injection diesel engine fueled with hydrogen. SAE 2003-01-0761; 2003. Academic Publishers, Beijing, Pergamon Press Oxford; 1985. p. 115–25. fueled engine; Int J Hydrogen Energy 1995; 0360-3199(94) 00052—2 20(4): p. 317–22. particulate in diesel engine exhaust SAE paper 910732; 1991. p. 1330–51. gas and hydrogen/natural gas blended fuels’ SAE paper 961103; 1996. p. 761–73. development, Ann Arbor, MI, 1973.
ignited engine using hydrogen blending. Combust Sci Technol 1997; 123:23–48.